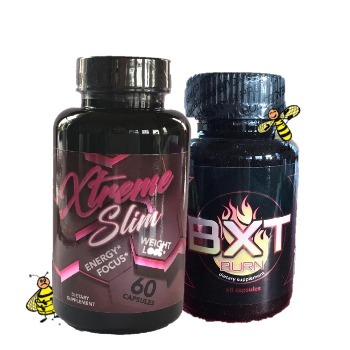 ** New ** Xtreme Slim Bee Pollen and BXT Burn combo uses thermogenics way of fat burning but takes it to the next level. Xtreme Slim is a natural herbal weight loss supplement that promotes fat metabolism, delivers a powerful formula to support energy and focus, appetite suppression and digestive health*. BXT Burn was formulated for the energy-seeker to scorch stubborn fat cells that like to hide away around the midsection, face, arms, back and thighs. Using ultra-amplified thermogenics, BXT Burn invokes a powerful state inside the body to not only fire up your metabolism but makes sculpting your body that much easier! BXT Burn uses a 3 stage fat loss with it’s synergistic ingredients. 1st it releases the fat that is stored inside the fat cell, next it transports the fat fast so that the fat then can be used as an energy source, and finally in stage 3 BXT Burn helps ramp up the activity of your mitochondria and converts it into ATP, giving you long lasting energy resources. Juglans Nigra Extract, Caffeine Anhydrous, Diodothyronine, Phenibut, L-Theanine, Juglans Regia Extract, Arecoline, Eria Jarensis Extract, Higenamine, Yohimbine, Bee Pollen.